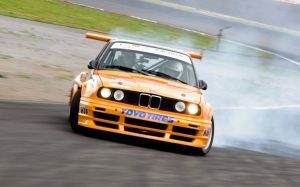 The desire to learn how to drift a car comes along with the question of choosing the right drift car for these purposes. It is best to choose the models with rear-wheel drive and a decent amount of horsepower under the hood. A suitable car can be found regardless of your budget. 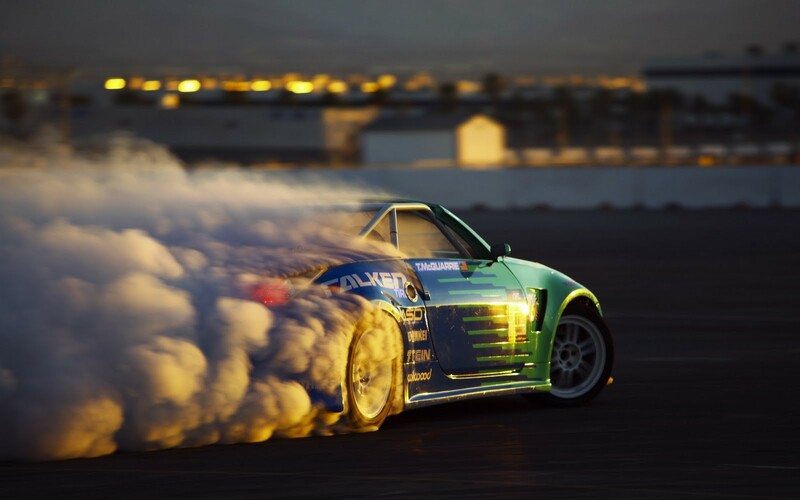 There is the top 10 cars for drift on any purse. Of all Silvius that Nissan conceived, past and expected models to be produced, the S13 was probably the only model that was the most controversial. It had the largest number of options, installed engines and chassis styles. Even after more than 10 years of production, automotive enthusiasts around the globe are still trying to figure out how and why Nissan called this cult car in different parts of the world. 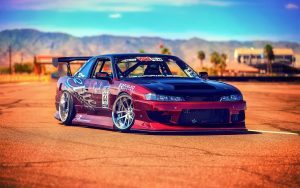 The first appeared in 1993, in parallel with the release of S13, all chassis numbers began with “S14”, the design was made in a new style, a longer chassis and a pair of fixed headlights. The jumping lights have disappeared in all markets. The new SR20DET engine also received new camshafts with variable valve opening times. For export models, there was no option with HICAS, except for the 240SX SE. This time the S14 was produced only in the body of the coupe, there was no hatch or convertible. The rear badges were strongly polished and placed on the right side of the back. The models for the Japanese market had J, Q and K finishes, similar to Sylvia S13. Export models had two or three trim levels depending on the country of destination. In 1995, the S14 received elevated headlights. It was known as S14a. Toyota Corolla ae86 is a classic, it’s a legend, it’s a dream for any car enthusiast who knows a lot about cars. And it does not matter whether it’s Corolla Levin or Sprinter Trueno, such a car will be the crown of any collection or the winner of a winding trail. On the automobile market, the “eighty-sixth” appeared in 1983. It was created as a model of the fifth generation of the Toyota Corolla, which can be a worthy addition to the model range. Needless to say, the result has surpassed all possible expectations for best drift cars. A special feature of this model was the rear-wheel drive, while all the others were transferred to the front. The cheap drift cars were appreciated not only at home in Japan, but also abroad. For some countries where the model was sold, there were special modifications. BMW 3 Series is a medium-sized car with a rear and four-wheel drive, the history of which begins in May 1975. This car is compact and sporty. This series was released as a replacement for the BMW 02 series and to this day cars are produced in the sixth generation. This is the most popular series from the whole range of the company. The total annual sales of the BMW brand (excluding motorcycles) account for about 30% only for these models. The third series has won numerous awards throughout its history. Also among the new BMW 3 Series is worth noting a specific model. It is “Gran Turismo” that was designed for long trips. This representative of the 6th generation provides its owner with maximum comfort with minimum fuel consumption. The tradition of creating the platform models Toyota introduced in the mid-1960s. And in the late 1970s Toyota Chaser appeared on the Japanese market, which shared one platform with such models of the brand as Cressida and Cresta. Moreover, the Chaser was specially created as a competitor to Nissan Skyline, and its first generation, descended from the assembly line in 1977, was produced in the same as that of the “opponent” body modifications – a sedan and a two-door coupe. Is there the downside of drifting an MX-5? You’ll get called a hairdresser. Is there the plus points? You’ll have the biggest grin on your face as you peddle the little Mazda around the track – it’s a truly awesome chassis to drive hard! The MX-5 first generation was launched in 1989. Arguably, it’s the closest you can get to drift an AE86 while still retaining some sort of sense of value-for-money! Powered by a naturally-aspirated four-cylinder engine, the 1.6-litre version puts out around between 90-115bhp (depending on the year), while the larger and later 1.8-litre packs around 130bhp. It doesn’t sound like much (that’s because it’s not), but you don’t actually need much more to get drifting as the first-gen MX-5 only weighs around 940kg. The 350Z makes for a great base for a drift car, what’s more, they can be picked up for under £4000 now too, which is a bargain when all is taken into consideration! The 3.5-litre naturally aspirated VQ35DE V6 motor puts out 280-300bhp as standard and the manual gearbox is reasonably bombproof too. 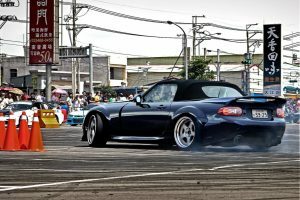 They’re easy to drift in stock form as well, but make a few tweaks to suspension and steering and you’ll soon be sliding around like a proverbial drift king. If your pockets are deeper than average then consider the updated 370Z as an alternative – it’s much of the same, with added poshness. 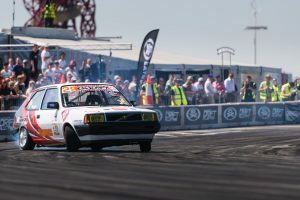 I bet when Volvo penned the little 340 they didn’t imagine it ever finding its way onto a racetrack, let alone sliding around and smoking the rear tyres! It might not be the most glamorous or stylish choice of drift chassis, but the little 340 is perfect for the younger discerning drifter, or those wanting to start sliding on a budget. Drift-specific aftermarket support isn’t great, but there’s not much you need here – start by choosing a hatchback model with the 1.7-litre Renault F-series engine, weld the differential, fit a bucket seat and lower the suspension and you’re all set. There’s a whole family of Nissan Skylines to choose from the best drift cars. While the R32 chassis remains highly popular in drifting, and the R34 offers updated looks, I’ve zoned in on the ugly duckling of the bunch in the name of remaining budget-conscious. Forget the range-topping GT-R models (as these are all-wheel-drive), and focus on the GTS-T – that’s the rear-wheel-drive model. The engine of choice is the RB25DET – a 2.5-litre, six-cylinder turbo’d lump that sings to the tune of around 250bhp. Once again, there’s plenty more on tap with some uprated components, improved cooling and a bigger turbo. You might feel like you need the extra oomph too – although the R33 only weighs around 1,400kg they feel a bit heavy to drift in stock form. Arguably one of the best-looking drift chassis there are. Take your pick – the earlier FC3S shape with its more angular lines or the later FD3S with its sleek curves, both are gorgeous! There’s just one sticking point – reliability. Mazda’s pistonless rotary engines are prone to all manner off issue once the mileage increases, or they’re put under continued abuse. If you can budget for the rebuilds then don’t let this put you off – they sound absolutely incredible at full chat.